Brrr! It's getting cold out there. And yikes! Your heating bills are starting to climb sky high. Fortunately, there are ways to stay warm without spending a small fortune or packing up and moving to a sunnier clime. Home insulation is the key to lower winter energy costs, keeping heated air in the house and cold air out. (It helps your house stay more comfortable in summer, as well.) And one of the major areas where you want to limit heat transfer is your roof. Here's how to insulate the roof so your family stays warm and cozy while your energy bills stay under control. The first step is simple and inexpensive ... just the way we like it: Work with what you have. Keep your roof in good shape via regular inspection and prompt repair. Fix loose, curling, or cracked roofing shingles and take care of any rotted wood or gaps in the roof fascia, soffit, and flashing immediately. This kind of preventive medicine will safeguard the inside of your home against icy drafts as well as water leaks. Next, you'll need to decide between a "cold" and a "warm" roof space. These terms refer to exactly where the roofing insulation will be installed (at joist level or adjacent to the rafters respectively), not to the resulting temperature in your living space. In fact, a cold roof space is advisable if you live in a part of the country that has severe winters. 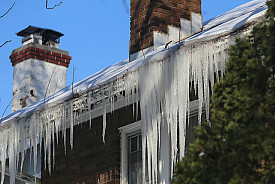 It is much less likely than a hot roof to cause fallen snow to melt and refreeze, forming hazardous ice dams. It's also simpler and less expensive to retrofit with insulation; however, a warm roof does allow a higher level of heat retention. Blanket insulation is one of the most common methods of insulating a cold roof space, and is traditionally manufactured from fiberglass. Your roofing contractor will install a vapor barrier as needed. He will then carefully roll out the blanket insulation on top of the barrier, ensuring that it is flush with the roof joists and eliminating any gaps between lengths of insulation. Have your contractor cut an opening in the blanket for the electrical components to prevent their overheating. Recycled or sheep's wool insulation offers a more environmentally friendly alternative to the conventional fiberglass. The former is usually made out of post-consumer cellulose recycled from old newspapers or out of cotton mill scraps or recycled fabric (which is where it gets its nickname, "blue jean insulation"), while the latter is made from natural sheep's wool. Spray foam may be used to insulate both hot and cold roofs. Have your roofing contractor double check that your roof is in good shape before attempting this type of treatment and make sure to coat all rafters or trusses thoroughly with the foam, to prevent heat transfer via the wood. The commonest version of the procedure involves spraying on a type of plastic, generally either polyurethane or polyisocyanurate, in the form of a foam which will harden into a rigid thermal insulation barrier. The foam is environmentally problematic, though, because it offgases VOCs for 24-28 hours after being sprayed on. During this time, residents of the house will need to find alternative accommodations until the fumes have dissipated. Concerns have also been raised about potential dangers to health when the foam is eventually removed. As a green alternative, cellulose insulation is available in spray-on form. It has a disadvantage compared to the plastic-based sprays, however -- namely that it is a less effective insulator. The technology for producing environmentally safer, efficient roof insulation sprays is still a work in progress.